What Is High-Structure, High-Substance Dialogue? Managing people is always getting harder, yet our research shows that that when things are going wrong in a management relationship, almost always, the common denominator is unstructured, low substance, hit-or-miss communication. This type of high-structure, high-substance, one-on-one dialogue is one of the fundamentals of strong management. But just because it is fundamental doesn’t mean it is easy. High structure means regularly scheduled and conducted according to a clear, well-organized agenda. That doesn’t mean it should be a one-way conversation. Of course, you need to allow for give and take. The first person you need to manage every day is yourself. You need to set aside the time every day to manage. I recommend a minimum of an hour a day, like taking a walk every day. During that hour, do not fight fires. Use that hour for managing up front, before anything goes right, wrong, or average. The second person you need to manage every day is everybody else. In an ideal world, you would talk with every single direct-report every single day. If you have more than four or five direct-reports, you will need to make choices. Maybe you can’t talk to every person every day. How many people can you possibly manage this way? How many one-on-one dialogues can you maintain? The answer is different for every manager. Be honest with yourself. If you are not able to maintain an ongoing one-on-one dialogue with an employee, you are not managing that person. If you have a chain of command, use it. 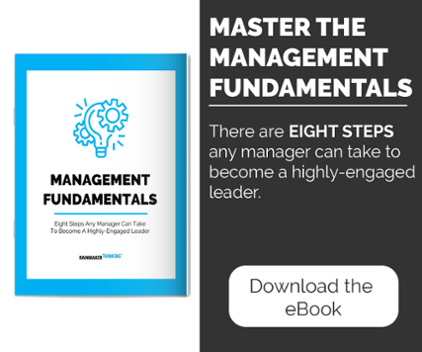 Focus first and foremost on any managers you manage. Talk with them about how they are managing. Every day coach them on the management fundamentals – make sure they are having regular one-on-ones with their direct-reports. All the way down the chain of command. Managers need to be taught to practice the fundamentals at every level. Or else your chain of command is not going to work. Never forget you need to make sure every single employee knows every step of the way exactly what is expected of them – exactly what they are supposed to do and how. One-on-ones are also where you answer employees’ questions as they come up. Get input from your employees throughout the process. Learn from what your employees are learning on the front line. Strategize together. Provide advice, support, motivation, and even inspiration once in a while. Together you’ll need to regularly think through potential obstacles and pitfalls – make back-up planning part of every work-plan. Anticipate and prepare. Train and practice. Together you will uncover on a regular basis what can be done and what cannot, what resources are necessary, what problems may occur, what expectations are reasonable, what goals and deadlines are sufficiently ambitious, and what counts as success versus failure. Every step of the way, stay on the lookout: Are there problems hiding around the corner or just below the surface? Small problems that can be solved now so they don’t turn into bigger problems soon? Resources we need to obtain or else figure out what to do instead? Key people in interdependent roles we need to be engaging? What’s changing? What’s about to change? What might change soon? Don’t be embarrassed that things change. It wasn’t your idea! Uncertainty is the new certainty, right? When priorities change, expectations change.